Surprisingly, Josie and Mrs Hora accompanied me to church today for what's always a particularly moving mass on Palm Sunday. We collected our crosses and had them sprinkled with holy water by Fr Stewart. Am looking forward to this week, the first Easter at home in a million years and so I can attend the whole caboodle of celebrations at St Bridgets. So, last week in Suffolk Nana gave me some pocket money and on our trip to Bury St Edmunds - yes he'd died again - I bought two commercial albums, something I'm very shy about doing although I have managed to surprise the children. So, Rudimental's 'Home' and John Newman's 'Tribute' have been placed between Blaine Reininger and Sarandon, and Myrna Loy and New Musik respectively. John's nasal tones are not liked by Mrs H but he doesn't use them that much in fact. Really liking his songs after a couple of listens I have to say, very very catchy. I like the Motowny, Northern Soul vibe he's using to great effect. Been working on Waggle Dance, preparing my thoughts to feedback to Henry and co at Grublin Games. Still hoping the family will indulge me later today to trial out and comment too. There's stickers in it for play-testers for starters! Backed another kickstarter during the week. Tony Boydell is a much respected - by me anyway - English designer and he spread the word about 'Of Mice and Lemmings'. It's a simple looking card game but I'm happy to back another UK project. 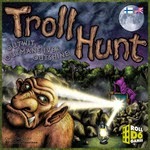 Another game I'm trying to help at the moment is from a small Finnish publisher. For some reason I think I like Finland a lot. It's the next country in Europe I'd love to visit. No idea where this has come from but there's a great quirky Finnish film, 'Frozen Land', and a band that supported Spearmint once, Laakso, were superb. I've also bought a few games through lautapelit.fi, top service. 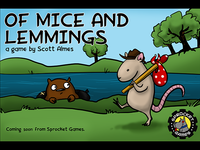 Anyway, here are two links to two ks campaigns that look like they could well do with some support; Of Mice & Lemmings and Troll Hunt.